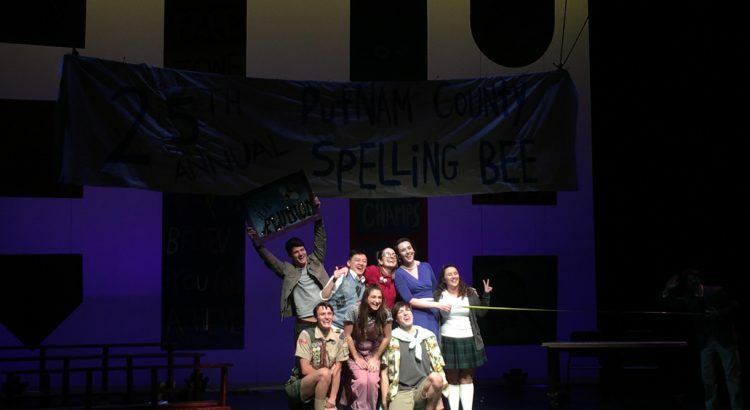 Six children with distinct personalities battle to become the champion of the 25th Annual Putnam County Spelling Bee. Griffin Silva, Lolly Duus, Diego Roberts Buceta, Chan Yu Hin Bryan, Camille Mancuso, and Emily Goodrich embodied these children in their goofy and youthful portrayal of Chip Tolentino, Logainne SchwartzandGrubenierre, Leaf Coneybear, William Barfee, Marcy Park, and Olive Ostrovsky respectively. Four audience members were also brought onstage to participate along with the Bee, an aspect of every production of this musical that truly makes every single show ever unique. As the audience members were gradually eliminated near the beginning, the final participant was serenaded off the stage by the comfort counselor Mitch Mahoney. Additionally, the show took its course as a pure Ann Arbor/University of Michigan production. During “Pandemonium,” a Bird appeared, and references to mumps were made as well. Everyone had their own insecurities and anxieties that displayed onstage in a theatrical yet realistic way. As they struggled with those anxieties, losing the Bee meant something different for everyone. From Leaf Coneybear’s acceptance that he is smart to Marcy Park’s realization that it’s okay to not be perfect and the best at everything, all the kids leave the Putnam County Spelling Bee stronger and better. Familial relationships was a large part of the character development. Logainne SchwartzandGrubenierre’s two dads put so much pressure and expectations on her, and Olive’s yearning for her parents came out during Olive’s “The I Love You Song”, where her mother and father appear telling Olive how much they love her. This moment is heartbreaking, especially in the context of the word “chimerical”, meaning “existing only as the product of unchecked imagination,” but Olive’s own love remained undeterred, and she she encourages William Barfee to win the Bee after she misspells her word in the finals. Throughout the course of the musical, the audience got highly invested in every single participant and every one of his or her special quirks. Whenever a bell rang signaling the elimination of a student, people gasped and murmured “oh no,” because even though we all knew this was a scripted show that had a single winner, we were still rooting for every single one of the children. Probably the star of the show was Amelia Dahmer, playing the official word pronouncer Douglas Panch in the most humorous and enjoyable way, eliciting thunderous laughter from the crowd with her bluntness and ridiculousness. Overall, this entire show is ridiculous, yes, but it contains the perfect balance of nonsensical silliness and touching self-discovery to make The 25th Annual Putnam County Spelling Bee a J-O-Y to watch.